Peter Jackson. London Stereoscopic Company, 2 December 1889. “Guess who was the most photographed American of the nineteenth century.” Fletcher University Professor Henry Louis Gates Jr., director of the Hutchins Center for African and African-American Studies, prepares for the surprise on my face. As it turns out, the answer is Frederick Douglass. Researchers have found at least 160 photographs of Douglass, who praised the medium of photography for enabling him to counter the racial caricatures so frequent in artistic representation of black people at the time. It should not be wholly surprising that one of the most prominent American figures of his era would also be the most photographed—yet black history is often marginalized in the history of the West. In the Hutchins Center's Cooper Gallery of African & African American Art , Gates and I stand in front of a portrait of a black man, Peter Jackson, taken in 1889. Jackson, wearing a top hat and a three-piece suit, occupies the full frame with what Gates describes as “Victorian African swag.” Jackson’s hands rest casually in his pockets as he gazes assuredly at the camera, refusing to be erased. 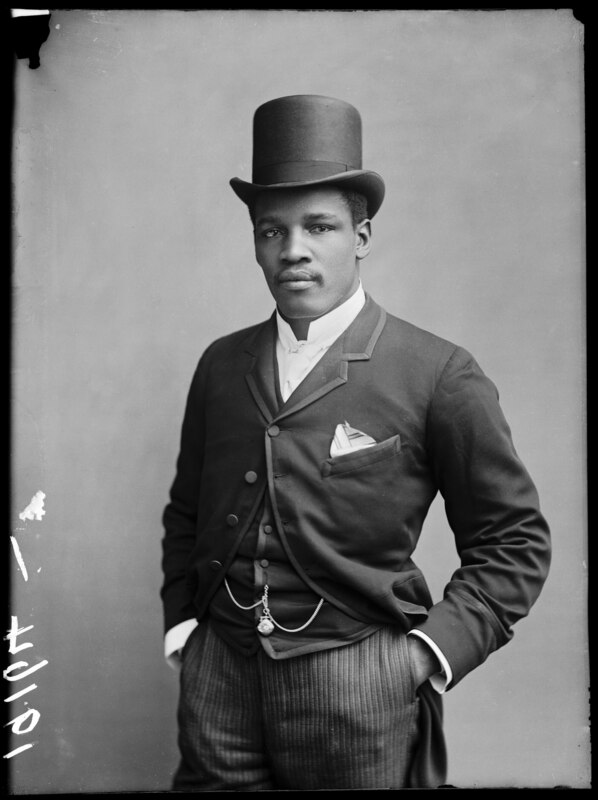 Opening to the public on September 3 and on display until December 11, Black Chronicles II  presents photographs of people of color (most are black, some are South Asian) in nineteenth-century Britain. In a world that rarely portrays black people in positions of regal power and dominance, the exhibit asserts the existence of people of color in the photographic record, and more broadly, the Western historical narrative. The exhibit’s stay at Harvard—a university campus where dining halls and libraries are adorned almost exclusively with pictures of white faces—marks the first appearance of these images in the United States. The exhibition, curated by Renée Mussai and Mark Sealy of Autograph ABP, a British nonprofit that advocates the representation of historically marginalized communities in photography, is a collaboration with the Hulton Archive/Getty Images of London; the majority of its photographs were printed large-scale from their glass-plate negatives for display for the first time since the 1880s. Black Chronicles II represents an ongoing research project for Autograph ABP. “During the early stages of the research, we made the somewhat maverick decision to showcase the work as it emerges,” says Mussai, who noted that she and Sealy released images within months of their discovery at the Hulton Archive. Eleanor Xiniwe, The African Choir. London Stereoscopic Company, 1891. Albert Jonas and John Xiniwe, The African Choir. London Stereoscopic Company, 1891. For black people, existence and resistance are not separate. The ability of these nineteenth- and twentieth-century images to engage with black activism in our current political moment is not lost on gallery director Vera Ingrid Grant, who, when asked about how the exhibition fits into ongoing conversations about race in America, said of Harvard, “This is not a political place, but an academic one—this is a nonprofit university.” But, at the Cooper Gallery, she added, “We may negotiate that line, and we will move forward with full intent to do what we may do. Art has a different and open discursive agenda in which things may be discussed that perhaps may not be addressed in a formal, textual space of discourse.” Grant aims for the gallery to be open to community outreach and student initiatives that bring it into more direct conversations about current events. And we are still here, speaking. Jenny Gathright ’16 is one of this magazine’s current Berta Greenwald Ledecky Undergraduate Fellows .